Summer is here, and in Texas, summer is hot and humid. That’s no surprise to anyone who’s lived here for longer than a few months, of course, but many people still don’t know how to handle the heat the right way. First of all, drink water! Hydration is important, and because of how humid it is in the area, we lose water very quickly. If your children are on sports teams during the summer or spend a lot of time outside period, make sure that they have a refillable water bottle with them or that they know when to come into the house. If you can, give them money for the vending machine somewhere and make sure they understand the importance of drinking water. Even if they don’t like drinking plain water, flavoured water is okay as long as it’s not sugary. Sugar will only make people thirstier. Second, be mindful of your clothes! The right fabric goes a long way in the summertime, and the best fabric to wear is cotton. Cotton is light, and more breathable than other fabrics. It’s also important that nothing is too tight, because tight clothing can trap sweat and heat, causing rashes and other uncomfortable situations. It’s also a good idea to wear brighter colors in the summer, because black and other dark colors trap light as opposed to reflecting it. In addition, long pants and sleeves can be manageable, but it’s truly best to keep as little clothing on as you can manage. Three, set up cooling systems! If your child wants to go to the pool or run through the sprinkler, that’s a great idea. 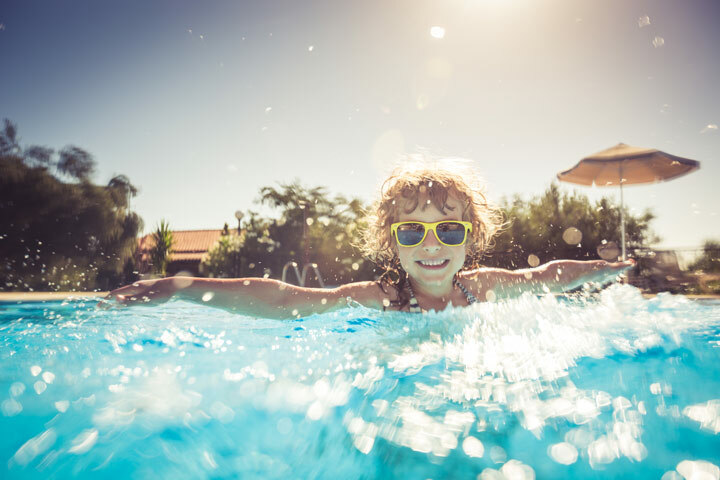 Many pools are kept at temperatures of around 64-70 degrees, ensuring comfort when the days go as high as 100 degrees. Make sure to shower as well — a hot shower can be enjoyable, but in the summer, a lukewarm shower is even better. You don’t want to turn it cold enough to start shivering, but showering in cool water will keep you cooler for longer. Lastly, and most importantly — know your limits! Know what heatstroke looks like, and know when your child needs to come and sit down for a while. Keep an empty bottle in the car that can be filled up for emergencies, and try to make sure there’s always a shaded spot to sit down in should it be needed.